Taken early in the morning, just before the sunrise. Long 2 and a half minutes shutter speed. I just spent an hour looking for this photo!! too bad about the dq. Too bad it was not legal and DQed. As it's great photo, though. Message edited by author 2006-01-27 01:56:28.
beautiful place , nice composition. Great photo! I love it!REally eye catching.You deserved it! You caught the light just right and used the diagonal of the fence line to your advantage. The colors are pefect (even down to the lights in the hoiuse) due to the long exposure before sunrise. Bracketed shots produced a winner! This is so beautiful. Congratulations on a wonderful photo! Congrats on your ribbon! I knew I recognized this place, but it is really amazing how you managed to capture it. Could you tell me the exact location in the Carpathians? In the picture you can see Bucegi Mountains. I was visiting a village in the Rucar-Bran pass, near Moeciu and Bran villages. I keep going back to this image, it is truly wonderful! Well done! Very admirling colors and such place to live. And that some people can still get up to catch something so wonderful. The purplish color of the photograph gives it a very intensive magical look which I loved since the first instant I looked at the picture. Beautiful, just beautiful. Congratultions!!! This was my favorite photo in the landscape challenge! Beautiful landscaping. Love the leading lines presented by the fence. Congrats! 2.5 minutes!!??!! Man, you opened my eyes. And thanks for bringing the Carpathians and Romania to our minds. My girlfriend spent some time in the Carpathians during her studies in Hungary and was very excited to see this picture and bring back wonderful memories. Very beautiful picture and a well deserved ribbon. Congratulations. A great scene and your choice of angle is great, along with the DOF. However, this shot is marred by some clunky processing in the sky and a skewed horizon which makes all the verticals in it quite distracting. Despite the popularity of this kind of editing, which I imagine you may have done to compensate for the flat light, I would infinitely prefer to see the orginal shot. Wow... Amazing. This picture is absolutely breathtaking. Congratulations on your wonderful pic, it is a cool pic. Congrats on your win - this is beautiful!! Congrats on a well deserved blue ribbon! This is so gorgeous. Lookout Ursula...I think you got some serious competition here!!! I'm from Montana and I'm not sure where this was taken, but it sure made me Homesick...very emotive to me...Kudos! Congrats on your well deserved blue! Stunning shot. Congratulations on your wonderful landscape. Congratulations on a winning shot! Beautiful landscape. Message edited by author 2006-03-17 23:21:09. This is a wonderful landscape shot. Congrats on your blue! Who gave this a 1??? ans a 2??? Of course things could be done better but does 8 or 10 make such a big difference?? Its a wonderful shot in many aspects. I understand if some people like it less than others but a 1??? It couldnt be beacouse of missinterpreting the motive landscape??? People who give 1-3 should HAVE to give a motivation to make the vote count. Great if somewhat eerie picture. I love Carpathian Mountains, hiked them many times. Congratulations on your well deserved ribbon ! Felicitari !!! Message edited by author 2005-11-16 06:04:23. I knew this one was a ribbon winner when I set eyes on it. Very well deserved ribbon. Congrats on the blue and this awesome photo. Lovely work, ethereal and different. Congrats on your first ribbon! man this is sooooooo good and looks like an amazing place. I would love to visit here. wow. Congratulations on your well earned blue. This is a run away! I say, "wow" and then "wow" again. Absolutely Breathtaking! Congratulations on your first ribbon! this image absolutely blows me away. i'm in awe. A sprawling epic of an image, Popescu! Many congrats on your Blue! Man, that's impressive! Beautiful scene, captured beautifully. Congratulations on your first ribbon! And a new fav for me! Wonderful photo, you deserve the ribbon...Congrats!!! congrats! just added to my faves. And there it comes another Romanian Ribbon. Well done and way to go! Goes to my favourites. Felicitari! Congrats on the blue! Wow, 2.5 minutes is one long exposure. Never would've thunk it from the photo. Well done! Lovely photo. I love the dusty purple hues and great leading line. Congrats. Congrats man! An excellent image and an excellent score! Congrats and well deserved blue! Going into my favorites and took my top score. Great first ribbon. wow, this is such a fantastic shot! congratulations on a well-deserved blue! well done! Excellent image. The more I look at it the more I see how it all comes together. Do share how you pulled this one off!!! GREAT JOB!!! The very best I've seen so far. Hope you do well in the challenge! I really like the composition, the landscape is quite astonishing and I like the subdued colors. Don't really see much if anything I'd change. I have fallen in love with this shot! The composition is just so stunning and visually beautiful. First you composed the shot to include many complimentary elements that the eye just follows and explores. The fence starts in the forground and flows down the slopey hill toward that red barn. This is like a trail that our eye naturally follows. After we approach the barn our eye roams the rest of the countryside that we see off in the distance. The rolling mountains, the mist that blankets them and the darkening sky that signals to use that it is time for us to go inside and prepare a cup of hot tea to drive away the chill air. Wonderfu!. I really hope this one ribbons. This will probably score very well, but not with me I'm afraid. I think it has too many competing elements to be a truly memorable image. Each of these elements (fence, rustic buildings, middle ground, misty valleys, majestic mountains, dramatic sky) might make a worthy subject in itself, or in combinations of any 2 or 3 perhaps, but seen all together the effect is of a dischordant jumble. The technical quality of the photograph is very nice, even if it does seem a bit tilted to starboard. Sorry to be negative (I am hoping to be constructive) ... and I'm sure you'll get many positive comments, so you can easily afford to disregard this one if you wish. 5. Again, beautiful art form was in this picture! Only a truly great picture makes you gasp the way I did when I saw this. Can't wait to find out how it was done (let alone with basic editing). I think this is a shot from Popescu. An easy 10. The quality of light is tremendous, it's a beautiful setting, has interesting lines and soft, interesting color. Very nice. Amazing. This will be my 10! Nicely done! Great photo! I love the way it draws me in... It's almost like following a path through the photo. Was just glancing through, and this one caught my eye. It seems to go on and on. The eye has so many places to go. Just lovely. What a great photo! I love the lighting and contrast you captured. I like how the fence kind of leads us in as it curves towards the center of the photo. Very intriguing. I love it. Amazing shot. It's a very magical scene. It almost doesn't look real. 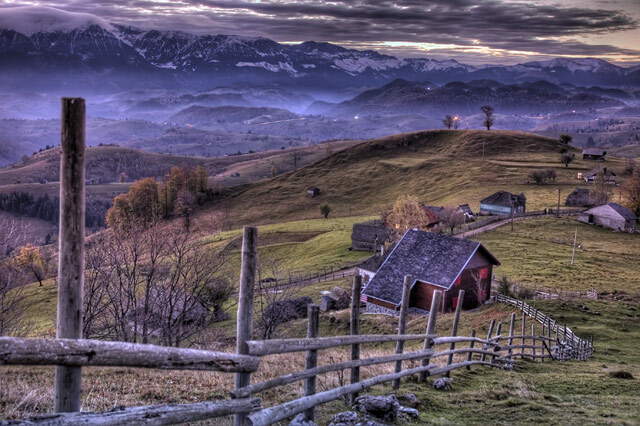 I love the different layers of hills and mountains and the placement of the little house is perfect. Very excellent. This presentation is lovely. There is an effect of real but not real. Like a painting with fine detail but still not complete sharp. Good luck. Gorgeous photo. I wish I were there. What does it mean,this photo has been validated? Well Iit looks like another ribbon winner here! Very nice work - lovely leading line with the fence and road leading us through the photo. What don't I love about this? NOTHING! Great angle and lighting. WOW! looks like an artist's painting! a superb photo! this looks really nice. i liked the composition a lot. What an amazing view, love the angle this is taken on, very unique. Sweet sweet sweet composition. Wonderful landscape. Great job. I am giving this 10. Excellent contrast and compostion. My only question is this appears to be a composite. what a valley. especially for basic editing, the processing is pretty impressive. could have benefited a bit from some sharpening. 7 - Very good. However I have no idea if the horizon is straight, based on the 'slant' of the houses and the clouds, etc so not sure (apologies if wrong). Criticism; not much, perhaps a bit sharper on the fence post(s), but maybe you would lose the definition in the 'scene'. The shot has the potential for a more dramatic feel in my opinion, but perhaps you were not going for that, but if so, maybe a tweaking of the contrasts, etc, especially bringing out a bit more coloring. Has a nice 'feel' to it as is though. Good perspective. I haven't seen all the photographs so far but I think none will be so fantastic. It's not just that the view is so breath taking,it's that this shot combines both line - shape composition and colour composition. The roof of the house provides a nice transition to the background which very strongly corresponds to the direction the fence provides. It's like from the first plane the fence is leading us strait to the middle plain. In the middle plain there is the house which leads us to the background. All the colours are of similar saturation and it seems that the scene almost completely fits the "exposure range" ( don't know the english word ). I could go on and on - I am so amazed by this shot. I give it a definite 10. You've given me the feel of holiday season. Jingle all the way. I really love this picture. Enough to rate it '10' Great shot. Holy smokes! this is amazing! you are amazing! i love the perspective, the fence, the barn down below, the awesome sky, and fog, EVERYTHING! A big fat 10 for you! and goin into my faves! Beautiful. I love the extreme downhill slant and the feeling that you might be rolling downhill. It's also great that you could include the vast scenery behind the houses, including the really dramatic mountains and sky. I love the fog hanging between the hills. Amazing....you own a 10 for sure!!!!!!! the colors in this picture are unbelieveable. interesting purplish lighting. it's neat how there are little lights that seem to be ontop of every hill in the background. great job! This is my favorite of all 402, love the colors and the perspective. Well Done! The best pic in this challange - in my eyes. I think the horizon is somewhat slanting but that doesn't matter. The zig-zag diagonal is very interesting and you can really feel the downhill slope. The placement of the cottage is optimal. Soft light and a nice tone. Neat shot. It looks almost like a movie set. Wow great colors. The purples are amazing! Mystical colors and lighting. Very nice. Is the horizon tilted? I'd love to know the details of how you arrived at this final result. It's captivating. Very, very nice. I like the colors, only voted on 25% of the pictures atm but this is the best one I've seen so far. i am blown away. this picture incorporates multiple elements (leading line, nice composition, colors, etc. ), and is a very strong photo. great job! Beautiful shot, I like your position on the fence. Definitely gets you with the WOW factor. Nice entry. This photo really sets a nice mood. Great work. Gorgeous! I love everything about this picture, the colours, the lines of the hills, te clouds, the fence, the sheds. Well done, 10! Nice angle seems to be missing something maybe try a day when people aren't using there fireplaces. man that background in the top is awesome!! nice job!! Proudly hosted by Sargasso Networks. Current Server Time: 04/25/2019 09:46:18 AM EDT.